I'm glad to review book of Ben Prusinski (blog) and Syed Jaffer Hussain (blog). I have known them a long time. They have many experiences about Oracle Database and Oracle Database Real Application Clusters, I have seen many posts on their blog, some conferences and events (Oracle User Group and OOW). They was written book titles "Oracle 11g R1/R2 Real Application Clusters Essentials". It's great for readers... I mean DBA and someone who interests/works about Oracle Real Application Clusters, because they can learn idea and real scenarios from their experiences. This book has 12 chapters, They write about High availability solutions for Oracle, They also explain Oracle 11g RAC architecture, Step by Step Clusterware Installation and How to use Automatic Storage Management (ASM), manage and troubleshoot Oracle 11g Clusterware, explain about RAC Database Administration, Workload Management, Performance Tuning, Backup and Recovery. 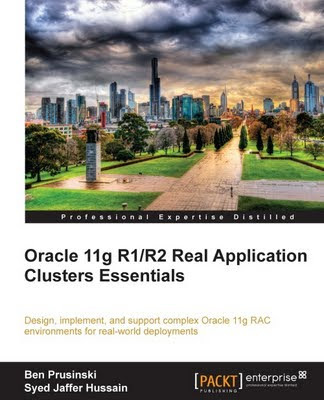 However, good chapter what someone need to learn: Oracle 11g Clusterware Upgrade and Real-world with Oracle RAC. They write about Oracle E-Business Suite (EBS) with Oracle RAC also. If you are looking the book about Oracle 11g R1/R2 RAC, This book can help for idea and learning. It is Easy-understand for readers, because they explain samples step by step and have pictures. However, readers should know about basic Oracle Database and Oracle Real Application Clusters, that will help readers more. By the way, What would you like to know about 11g R1/R2 Real Application Clusters? If you look for Oracle 11g Clusterware Upgrading, ASM Management samples, Troubleshooting Oracle RAC. This book can help.